1 ft. 10-13/16 in. x 2 ft. 8-9/16 in. 2 ft. 8-9/16 in. x 3 ft. 9-3/16 in. 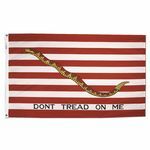 The First Navy Jack flag also known as the Don't Tread On Me flag with heading and grommets and line, snap and ring.